Milk thistle has nothing to do with cows. The natural herb doesn't help them make more milk but it does seem to help canine whelping and lactation. You cannot see or taste the coating of the herbal tincture, but each milk thistle pill has been coated with the substance. I know because I use them frequently. It is hard to tell when they will be needed, so they are in my car, in my house and near the dogs. Milk Thistle is a liver detoxifier par excellence!! I found Milk thistle after one of my dogs had his teeth cleaned. Toy dogs are notorious for having bad teeth and the small mouths and small jaws make it almost impossible to clean them adequately at home. So they have regular visits to keep their teeth and gums healthy. The tooth cleaning requires anesthesia. The day after a visit, one of our males developed a weakness in his hind legs and was wobbly. It was frightening to say the least. I contacted my Naturopathic Physician for advice. 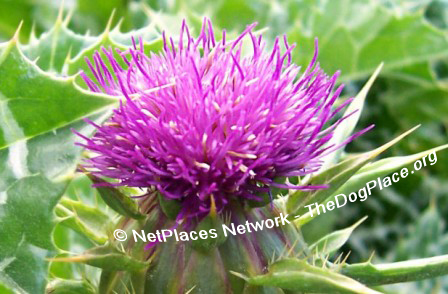 She recommended Milk Thistle to eliminate the toxins in the liver from the anesthesia.. I began giving the milk thistle in some Nutrical and repeated several times during the day. By the 3rd day after the dental visit, he was normal and was none the worst for the experience. Now I use it for my animals and myself on a regular basis when the liver may be compromised. Recently, my Niece went to her doctor due to some problems she was experiencing. She was told that the blood work that had been done showed that her liver was not functioning properly. There may be growths and problems that could possibly require a liver transplant. She was scheduled for an MRI - ASAP, which, as life would have it, was not for two weeks. My Niece and her Mother were concerned and frightened. The only words they had heard for sure was “liver transplant”. No medication had been prescribed by the medical doctor. I suggested that she get some Milk Thistle and use it until she had the MRI. This time she took the suggestion and used it daily until the test was done. When the Doctor came in to give them the MRI findings, he said the liver was uneventful. The liver transplant would not be necessary and no medication was prescribed on that visit. The only thing she had done was use Milk Thistle for two weeks. Love your liver. It works hard for you. Try a little Milk Thistle some time. Your body will thank you.